Inspirational 'pohanginapete', who obviously makes lots of other people (as well as me) think for themselves, has just triggered great thought-trains about forests. This is his photograph of forest in New Zealand. It's interesting, and I could see that I'd really like to be there and have a look around....but does it contain any of the elements that make Northern European forests so very important to Northern Europeans? Yet, interestingly, the photographs on the above link to his photographic blog do have that effect. European forests are where people go for restoration and transformation. They lie deep and impenetrable in the European psyche, fuelled by traditional stories, and deeper, darker myths and legends, not to mention the depths of psycho-analysis. Small children are abandoned in the forest by jealous and wicked adults, often step-mothers. There they learn to fend for themselves and to overcome evil (Babes in the Wood, Hansel and Gretel, Snow-White). Young girls face unspeakably awful dangers when they go off alone into the deep dark forests,( Little Red Riding Hood, Goldilocks - and what was Goldilocks up to anyway? She had no reason at all to be there, all alone. Perhaps it was plain willfulness. At least Little Red Riding Hood was sent there, to look after Grandma). Northern European children emerge triumphant from these ordeals. They overcome the wicked adults, and the evil forces. They unite with the gentle influences; the small furry animals, the plants that protect them, the social outcasts, like the dwarves and gnomes. Dangerous animals, bears and wolves, are outwitted or tamed, or frightened into submission. A spell of time in the forest, the experience of being lost, frightened, alone, seems to be an essential rite of passage in childhood fantasy. Facing the darkness, facing the wolves, conquering the ill-intentioned adults and emerging wiser, prettier, stronger and more handsome seems an essential element in European childhood. Russian children face even more terrifying dangers, probably because the forests were, and still are, limitless. There are witches behind every tree, and their appallingly ill-constructed houses can run about on chicken legs. There is even more magic, more transformation, to enable the children to return to Babushka and the bubbling samovar. Yet still the children triumph. Even if they die in the forest their little fragile bones will emit a silver glow which leads to the downfall of the greedy and the powerful who abandoned them there in the first place. We tell our children these stories from their babyhood onwards. My older son used to say, 'Babes in the Wood!' as a form of explitive when he was three years old. I wonder now why I did it; why I fed them such terrifying images. They loved it, that's why! The books, pictures and stories were so ubiquitous I could not have avoided them. Even at such an early age they knew that goodness and kindness could keep the darkness in its place, and that by the end of the story the forest would be within manageable proportions. The forest is never far away. This antipodean forest is very far away. It looks as if it might be warm and friendly, full of curious creatures that bumble about harmlessly in a Disneyish way. Is it full of magic and mystery? I really hope so. I hope it's a truly terrifyingly magical place. You give me wonderful shivers. We live by the stories we tell. Thanks for the kind words, RR! A great post; thoughtful, thought-provoking, and beautifully written (as usual). I laughed out loud at "eating things scraped off dead logs". 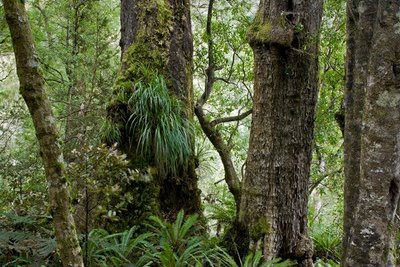 As for the nature of New Zealand forests, they're distinctive in many respects, but two in particular: they're not deciduous, so they superficially change little with the seasons, and none of the animals one might encounter is likely to cause one harm. Nevertheless, they're indubitably dangerous if not respected — it's the weather and rivers that cause most of the harm. But is it full of magic and mystery? Ah, ... I don't think I should say. The best way to find out is to go there. Zhoen: Thank you. I think it must take an awful lot to scare you! I used to tell forest stories in sign language. Now that's really spine-tingling stuff! PPete: Oh, that's kind. Thank you. If I could have a general anaesthetic for the journey I might be tempted to come and investigate. Julie: I have a sad feeling that you could be right about the nasty observer. It depends how near the motorway is to the forest, I'm afraid. I was brought up on Grimm and Hans Anderson and was scared! Great photo. Imagine a forest that doesn't change with the seasons. Strange. Isabelle: Yes, being scared in a safe environment is important! The NZers would not agree, but the seasonal changes in a forest add so much to its magical properties. Our antipodean forests are magical and mysterious, but I haven't found them terrifying. Once, long, long ago, I and three friends became lost and subsequently benighted on a day-trip in a forested range not far from our homes. Unfortunately, we hadn't had the foresight to leave a trail of pebbles, so we knew that the only thing to do was stay put because (given that the weather was mild and dry in spite of its being Easter)the one danger was falling over a bluff in the dark if we tried to find our way out. We laid down dried ponga (tree fern) leaves for a bed and shared our one bar of chocolate for dinner. During the night we woke up to noisy rustles, but they were benign - probably a hedgehog. When I went to England I arrived earlyish in March and was astonished to see the leaf-bare woods on the hills. I'd never seen pictures of winter woods and it had never occurred to me before, in spite of its obviousness, that forests (of deciduous trees, of course) would be just brown trunks, branches and twigs. It made me wonder what Robin Hood did in winter. Peregrina: You make me think.....do hedgehogs hibernate in New Zealand? Ponga is a much better name than 'tree fern'. Robin Hood (and his Merrie - not gay - men, and Maid Marian) lived in a hollow tree in winter, and I bet their clothes were mud-coloured. Your story is pure Babes in the Wood with a modern twist! Many thanks. Yes, hedgehogs do hibernate in NZ, at least in the cooler, more southerly parts. We have a resident one that disappears in autumn and reappears in spring. By the way, did you know that they lost their fleas on the voyage out from England? Maybe it was all that salty air. Do you mean to say that Robin Hood and Maid Marian actually had two outfits, one for summer and one for winter? Yes, Peregrina, I'm sure all the fleas and other vermin are still here in UK! But I'm delighted you have hedgehogs, who are the most charming garden inhabitants. You can join the club and get all the current info! How many changes of clothing would you have if you were living in or up a tree with a bunch of Merrie Men?